Reviving a tradition that had all but disappeared for over 150 years, the O'Hara family established a brewery in their home county of Carlow in south-east Ireland in 1996 producing beers of traditional Celtic and Irish origin, O'Hara's Irish Stout was born in 1998, winning the Championship Trophy and two gold medals at the International Millennium Brewing Industry Awards in 2000. The O'Hara's brand has now arrived at it's 10th anniversary. 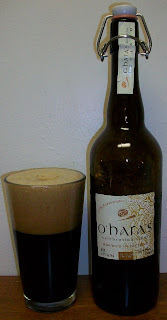 To mark that occasion we present as a limited edition O'Hara's Celebration Stout - rich in Irish malts balanced by a full bodied bitterness and delicate spicy aroma from Northdown and Fuggles hops with a luxurious chocolate finish. This beer was hands down the best Dry Irish Stout on the planet. Yes, I said was. The only problem with this beer is that it was a limited addition 10th anniversary brew. I went into deep depression by the end of 2008 when I could no longer find this beer. I was the last one to buy a bottle from State Line Liquors because they accidently left one in the office and I asked about it. My son John (BierVlog) found a few bottles last year. Of course we consumed them but they were a little dated and not the phenomenal brew that it once was. To my utter and complete surprise John came over the other night with a bottle of this exquisite ale that he bought at a deli in Philadelphia. I just can’t wait to see what this beer holds for me. Is it going to be stale flat dud, the phenomenal brew I fondly remember or something in between? I do know this is way past its prime but I can’t wait to see what the ole girl has left in her. A good sign right up front. This beer popped when I released the swing top cap, followed by a healthy amount of smoke. The beer pours a dark “Stout Dark” (VideoBeerReviews) brown. Completely opaque with a dark rich tan almost chocolate milk colored head. The head is sizable. I though I would have to give it an aggressive pour to get a head like this. It turns out I was too aggressive. Oh my! This smells great! I am really psyched this has all indications of still being that great beer I feel in love with. The nose is luscious. It is filled with dark roasted malts, a velvety chocolate aroma, and there is also that classic dry Irish Stout hoppy aroma. Yes, I did say hops. That was also a unique characteristic of the Irish stout that I loved. Well, as usual I got my hops up only to be disappointed but not totally. Let me explain. Even though this beer is not the same as it once was, it is still, the best Dry Irish Stout on the planet. The taste starts out with those sweet roasted malts up front. In mid-sip there is a growing malt bitterness then the back end is both bitter and sweet with those dark roasted malts giving you a creamy mouthfeel. The finish is fairly dry but also with that classic lingering roasted malt coating in your mouth. This is still fairly smooth but it has picked up a bitterness that was not there in 2008. All and all this is still an exceptional brew. I want to come up with an old girlfriend analogy but I personally can’t relate to that since I married my high school sweet heart and have been married for 29 years. Happily too I may add. The once young and vibrant girl has aged. She is not as perky as she once was but deep down inside she is still the same ole gal. Yeah, that was pretty bad. The head on this beer has not quit and the lacing is still very impressive. I really didn’t expect this beer to still have so much carbonation, it is extremely carbonated for beer that is at least two years old. I’ve gotten accustomed to the extra malt bitterness that the beer has developed. I am really enjoying the beer for what it is now not trying to force it back into what it was. As it warms it really opens up nicely. Even the aromas on the nose are richer then they were when it was colder. The beer is at 67 degrees now and still very nice. It has not picked up any unpleasant flavors whatsoever. The malts seem much smoother now and so does the mouthfeel. I’m not sure if that is the warming of the brew or if that is me getting accustomed to the new characteristics of his fine lady. Well the old girl still has it. Even though she is far past her prime and just a shadow of what she once was, she is still the best Irish Dry Stout on the planet. Well, at least any of those that have hit this palette. I really wish they would brew this every year. Even if it was a seasonal. John went back to the deli and bought two more bottles. So I have at least two more to savor.